Get to know your social audience. We have identified over 600 million social profiles, defined across over 40,000 distinct segments. Know, segment, and reach your social audience as never before. We acquire essential insights across 60+ social networks and every major blogging platform. Find out what they like: from their interests to their favorite brands, celebrities, and TV shows. Compare their affinities to those of various personas. Get to know your social audience. Understand your social audiences more extensively using standard demographics: gender, age, ethnicity, economic brackets, education and geography. 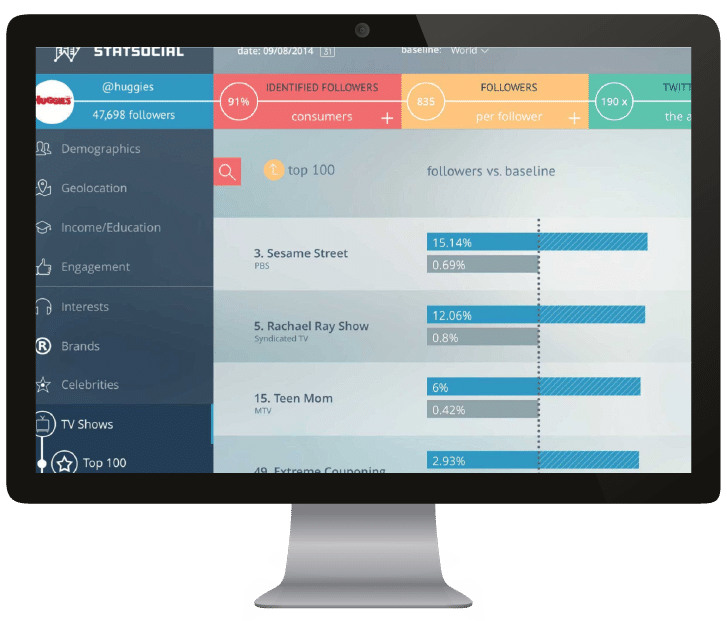 With 40,000+ defining variables, gain keen marketing insights about your audience composition and its characteristics in a highly flexible manner. Easily browse through our vast taxonomy. Global and local search. Sort metrics by absolute value or relative to a benchmark population. Set your baseline to the global Twitter average population, or to custom benchmark populations for comparison purposes. See what stands out from the average. Reports, various export formats, and API access. Custom data analysis available upon request. If you have an audience at hand (e.g., an @account’s followers, people mentioning an @account, sharing a certain link, tweeting a certain #hashtag, keyword, or from a certain venue, etc.) we can tell you everything you could possibly wish to know about those people. But that’s not all we can do. If you have a specific segment in mind (e.g., 25 to 34 year-old males who make over $50,000 a year, live in NYC, and watch Game of Thrones) we can find and target those people for you on major social networks. We can also tell you everything else about them that you may care to know, from their interests to what other shows they watch, their favorite brands, music, celebrities, etc. Our proprietary multi-layer taxonomy indexes 370 interests, 1,100 tv shows, 8,200 consumer brands and 22,000 celebrities. We will find what you are looking for, even if it’s a needle in the hay. Our data is not just good-to-know statistics. For every combination of segments you analyze or build, we have the corresponding social handles to match to. By matching your desired audience segments to the corresponding identities of social users, you can ensure that you’re reaching precisely the right audience in your campaigns.